This Best Shortbread Cookie Recipe yields tender, crisp, buttery, and perfect shortbread cookies every time. A simple straightforward recipe with under 30 minutes of prep time. 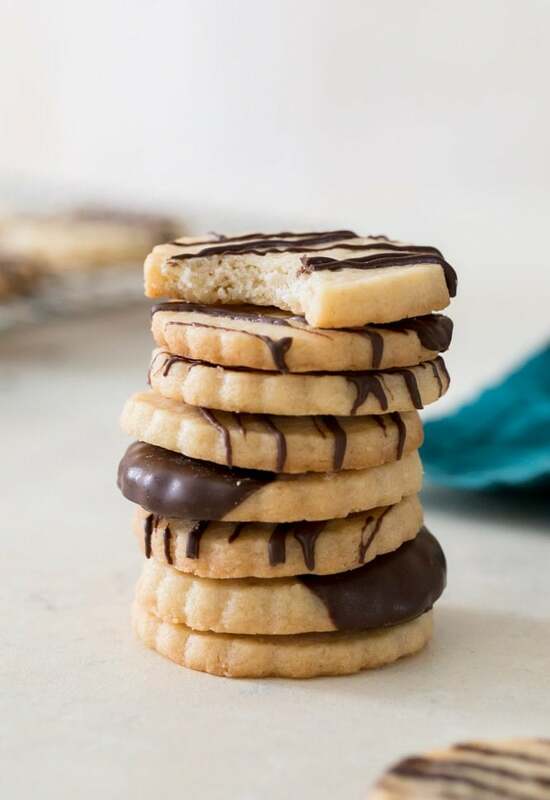 I feel like Shortbread Cookies are underrated. They’re simple, admittedly a little plain looking, and not nearly as flashy as a stack of Monster Cookies or even Chocolate Chip Cookies. They’re probably not the first cookie you’d reach for on a cookie tray, at least I know they never were my first choice. But maybe they should be. Yes, they’re simple (only 5 ingredients), no, they’re not very flashy (though dressing them up with a chocolate drizzle helps), but the taste is sheer, simple, perfection. 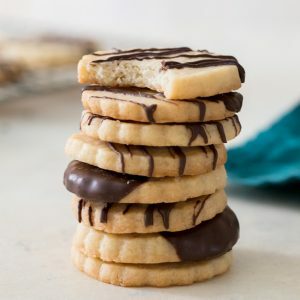 Buttery and tender, shortbread cookies have a delicate crispness to them, a light airiness that’s detectable as the crumb crumbles with that first bite. It’s their simplicity that actually makes them so good. 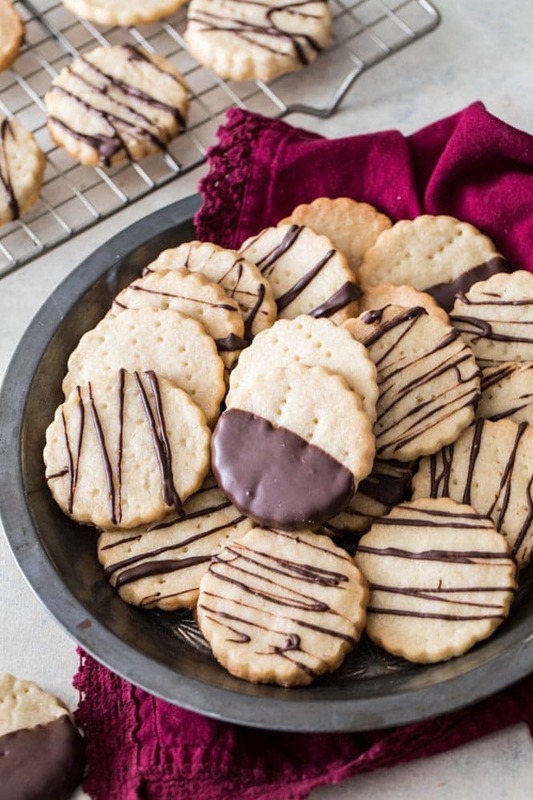 And for such a simple recipe, there are so many shortbread cookie recipe variations out there! Months ago I began testing recipes and tried a lot of variations before I settled on this one. I tested with powdered sugar, granulated, and a mix of the two. I creamed the butter, melted the butter, and cut it in with a food processor, a pastry cutter, and even a grater (it worked well with my biscuits, thought it was worth a try here). 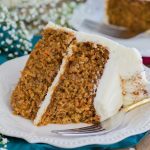 This recipe not only came out on top in terms of taste and texture, it was also one of the easiest variations that I tried. Let’s get to it. The vanilla extract is not a traditional shortbread ingredient. You can leave this out if you’d like, but I have trouble saying no to the flavor of vanilla. What’s the Difference Between a Sugar Cookie and a Shortbread Cookie? The main difference between a sugar cookie and a shortbread cookie is the ingredients and the ratios of the ingredients. 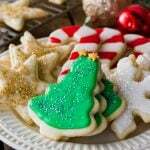 Sugar cookies typically contain eggs, while shortbread cookies do not. 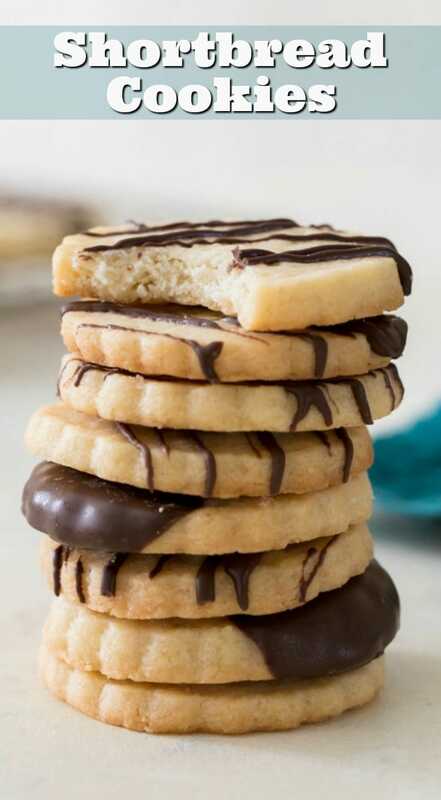 Shortbread cookies also have a higher ratio of butter to flour, and the resulting cookies are usually more crumbly and tender. 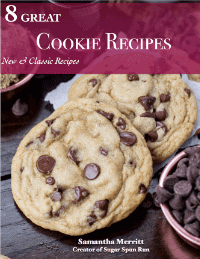 Here is a great sugar cookie recipe if you happen to be on the hunt for one! Do You Have to Refrigerate Shortbread Dough? For my shortbread recipe, refrigerating the dough is required. A minimum of 15 minutes is needed to ensure that the dough is manageable and that it’s not going to spread in the oven. You need to refrigerate this recipe for at least 15-30 minutes, but it can stay wrapped up in the refrigerator for up to five days. Jeep in mind that if the dough is chilled for longer than an hour, it will become really firm and difficult to roll. Let the dough sit at room temperature for about 10-15 minutes and it should be softened enough to roll and cut out. A sweet and simple recipe for tender, buttery shortbread cookies. 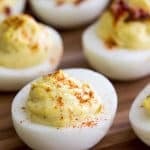 A quick and easy recipe that can be made in under an hour. Drizzle with chocolate if you'd like! 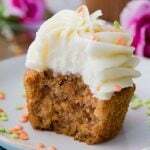 Includes a how-to VIDEO just below the recipe! 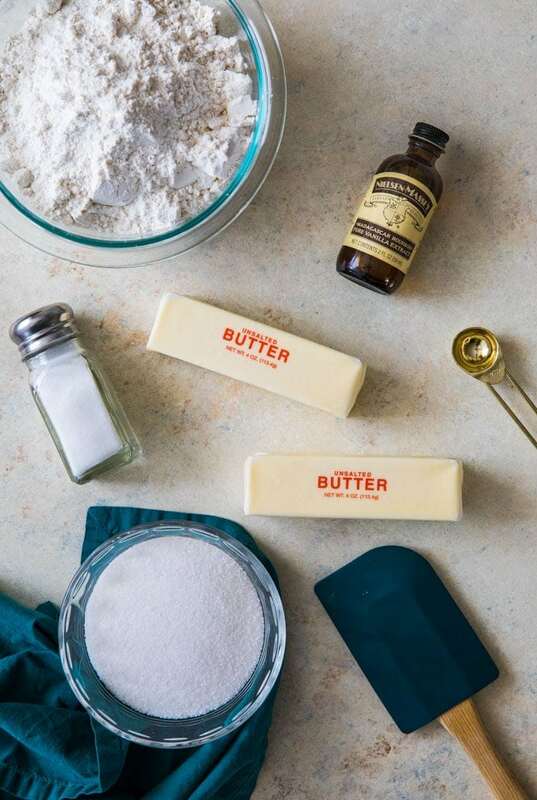 In a large bowl with an electric mixer (or using a stand mixer) beat butter until creamy. Add sugar, vanilla extract, and salt, and beat until completely combined. 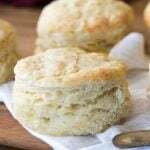 Gradually add flour until completely combined into butter mixture. Be sure to scrape the sides and bottom of the bowl as needed so all flour is incorporated. Stir until combined, but try not to over-work the batter as this can warm it up and make it sticky/difficult to manage and make your resulting cookies tough. Use a spoon or spatula to work dough together into a ball and then transfer to a piece of plastic wrap or wax paper. Work into a disk then transfer to refrigerator to chill for at least 15-30 minutes. Once dough has nearly finished chilling, preheat oven to 350F (175C) and line a baking sheet with parchment paper. Set aside. 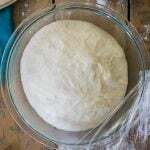 Once dough has finished chilling, transfer to a lightly floured surface and use a rolling pin to roll out to just over 1/4" thickness. 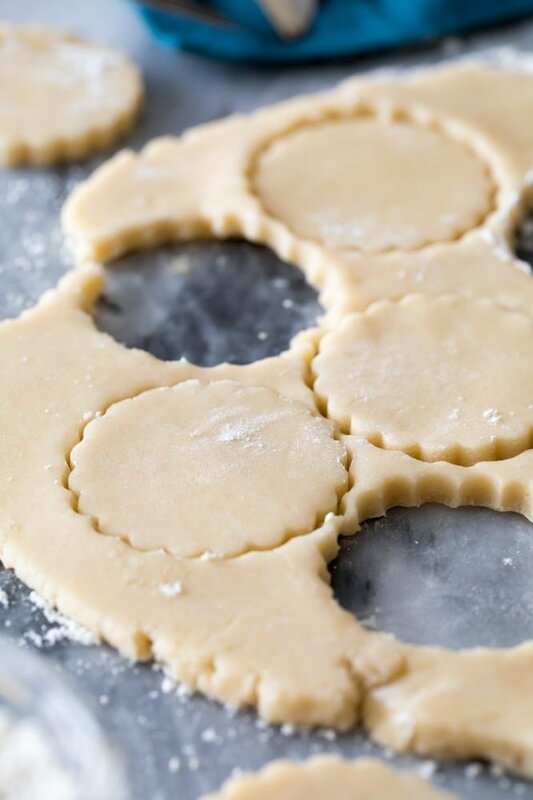 Use round, 2 1/2" cookie cutter to cut into shapes. Use a spatula to transfer to prepared baking sheet. Space cookies at least 1" apart. Bake in 350F (175C) oven for 15 minutes or until edges are just beginning to turn a light golden brown. Allow to cool completely on baking sheet before enjoying or dipping in chocolate. If you'd like to dip/drizzle in chocolate, prepare melting wafers according to instructions on packet (or melt chocolate chips in a heatproof bowl in 15 second increments, stirring well between, until completely melted). 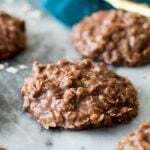 Dip cooled cookies in chocolate or drizzle chocolate over cookies. 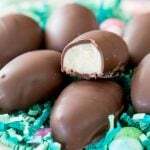 Allow chocolate to harden completely before enjoying. ¹Vanilla extract is not a traditional shortbread ingredient but I love the flavor that it adds. Feel free to omit if you prefer! My usual shortbread uses powdered sugar, what is the benefit of granulated sugar? Does the flour have to be sifted? Hi! Can these be frozen then thawed out a few weeks later to enjoy? 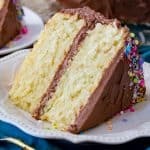 Would I wait to drizzle the chocolate once thawed out? Thanks for your help! Can you decorate these using royal icing? 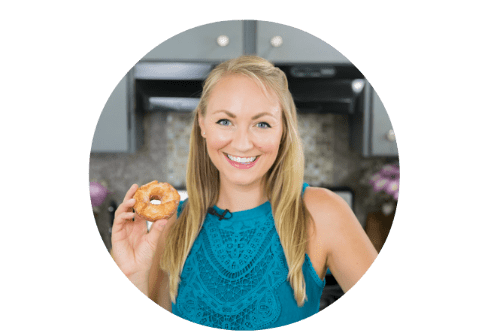 What do you think about using almond extract? These look yummy! 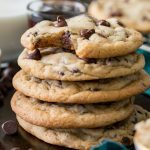 Do you think these cookies could be made with Earth Balance (vegan) butter (and still be yummy)? –Thanks!